As seen in the CX/road disc brake drama, the bike industry is mired, for better or worse, in tradition. Cycling optics is one such area where massive change is avoided, and minutiae is celebrated like the discovery of the god-particle. For those of new to the Boredom way, I’m an eyewear addict. And when I say addict, I’m talking 30+ pairs of glasses from at least 6 different manufacturers. And while I may gravitate towards traditional eyewear concepts, I’m also open to change. I’ve been riding these voor the past year, so I’ve definitely put some time in these—consider this a long-term review. You get the point, from initial appearances, the Magnetos are big in every sense imaginable. There are many that will overlook, bypass, or ignore these beauties simply on their incredible ostentatiousness. However, I’m drawn to this like a hipster moth to a fluoro flame. So what does this fluoro hipster do? He requests the Crystal Fluo with the Yellow Fluo Helium as a test submission. 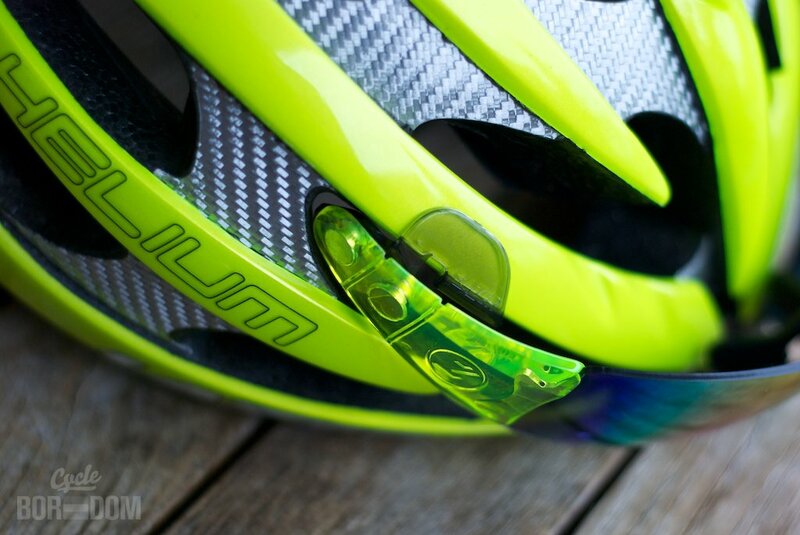 The #fluodoping is strong with this one. Shield style eyewear is technically superior in that it provides you with full 360˚ vision. Yes, 360˚—like a friggin’ owl. 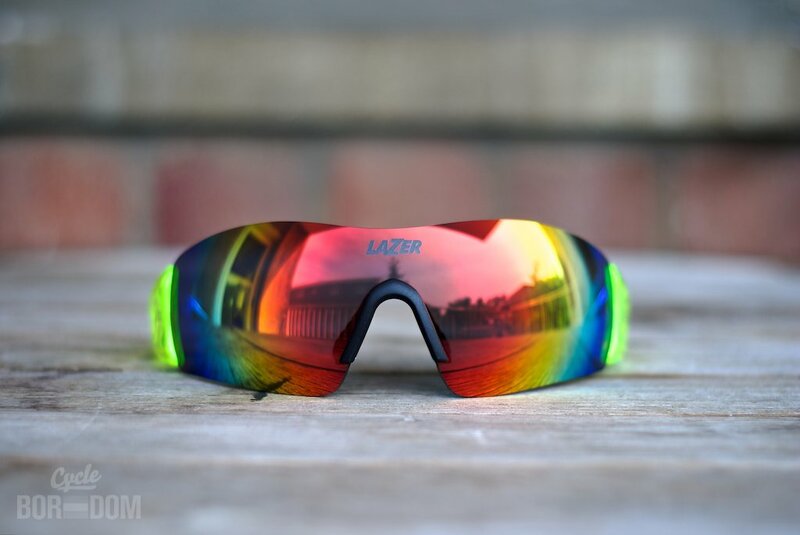 Lazer’s M1s are no different in that respect. 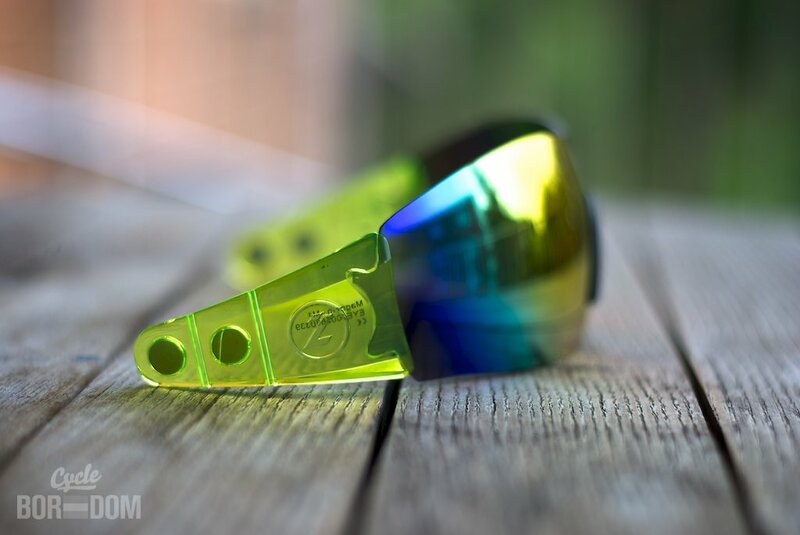 However, their rainbow mirror coating, the use of 80’s sourced crystal fluo yellow temples, and quad-core magnets gives you a distinct advantage over those donning inferior lenses—FUTURE VISION. Clarity is so defined you’re able to perceive gaps in the spacetime continuum allowing you to navigate them adroitly. There’s no discernable distortion in the curve of the lens, nor is there any adverse color alterations. While not as light as others, they’re not prohibitively heavy. I imagine most of that weight is due to the sheer size of the lens as well as the magnets. 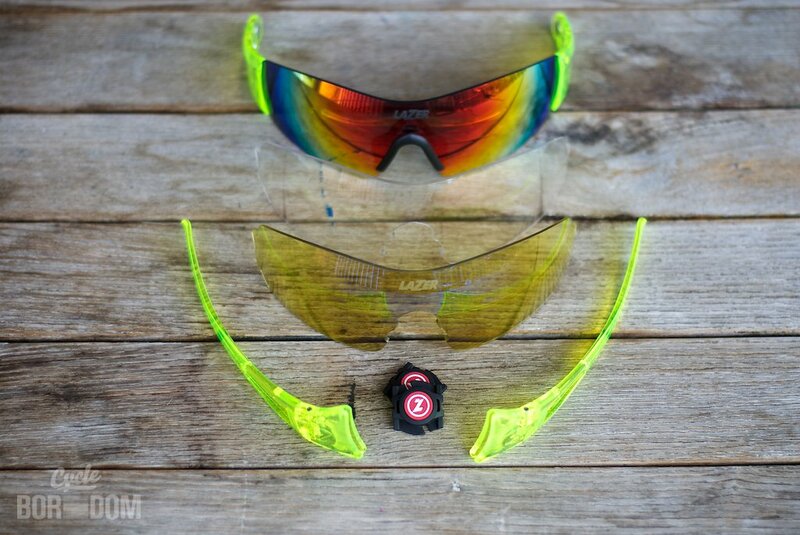 Lazer also provides 2 extra lenses (yellow/clear) for changing conditions and a hardcase to store everything. 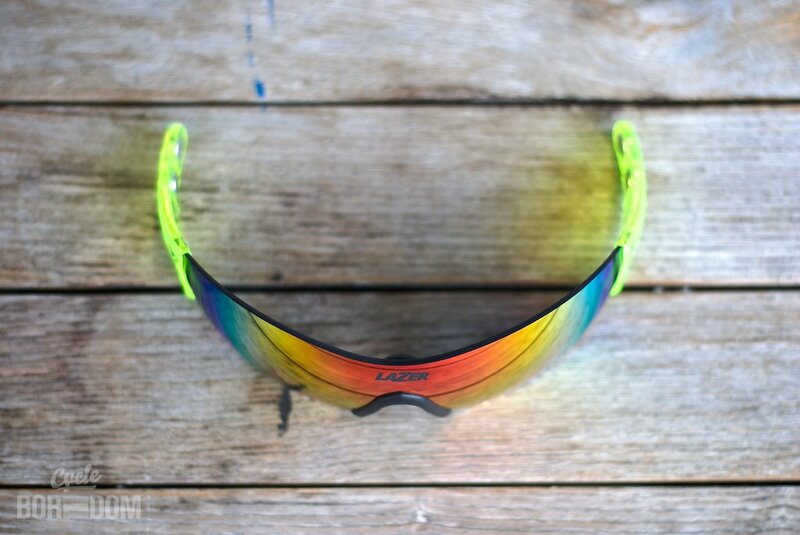 At this point they’re pretty sweet cycling optics for not so much money. Even if you don’t use the included Magneto interface, the traditional arms do the job. Now that we’ve touched on the power enhancing magnetary devices, let’s address them in full. They are there, and there are four of them. How do they work you ask? Know those mystical magnet bracelets? They are diametrically opposed to them. So yeah, they work. When paired with the Z temple power point devices they adhere to your skull like jungle leaches to your undercarriage after wading in hip-deep tropical cesspools. There is minor movement. I know, I know—totes deal breaker right?! I mean, why try anything new if you ain’t gonna get it right, right?! However, I did say *minor* movement, and it’s finite. Whereas many glasses might continue down your nose if unchecked, the M1 reaches a point where it goes no farther. Also, considering the windshield-sized lens, even when there is slippage you’re still fully covered. If you suffer from overwhelming OCD, the movement will be an issue. I’ve minored in OCD and I’m cool. Although, I’ve noticed that the movement changes depending on the positioning of the Magneto interface on the straps. There might very well be a sweet spot depending on the shape of your head which obviously changes with each person. My first ride exposed the Magneto’s Achilles heel: no temple arms to stick into your helmet whilst scaling cols or ordering delicious espresso apres col scaling. Few instances arose where I needed to remove my glasses due to the receding sun, but they happened. Luckily, this single hitch in an otherwise genius departure from the norm has been adressed. Lazer created the Mag Docks to attach to their Helium (possibly others) helmets in order to provide a place to store the optics when no longer needed. They work remarkably well. Once I figured out the correct placement giving the magnets ample real estate to connect they adhere with tenacity. Positives include: ease of placement (no concentrating on finding the correct ports while riding no-handed), no arms gouging your skull as you blindly stab each port for the right spot, no arms means no headaches due to said stabbing, no movement after engagement means no rattling which is sometimes the case with other glass/helmet combos, and finally, no interference with the helmet nor its retention. Only question is whether or not they’d work on other brands helmets. Obviously you could attach the regular full length temples if you don’t own a Lazer, but it’s an interesting thought. Based on the system now as it exists interfacing with the Helium, the Lazer Magneto M1 will always slip ever so slightly. Typically wraparound systems use curved temples to pull the glasses towards the face. Some do it well, many do not. 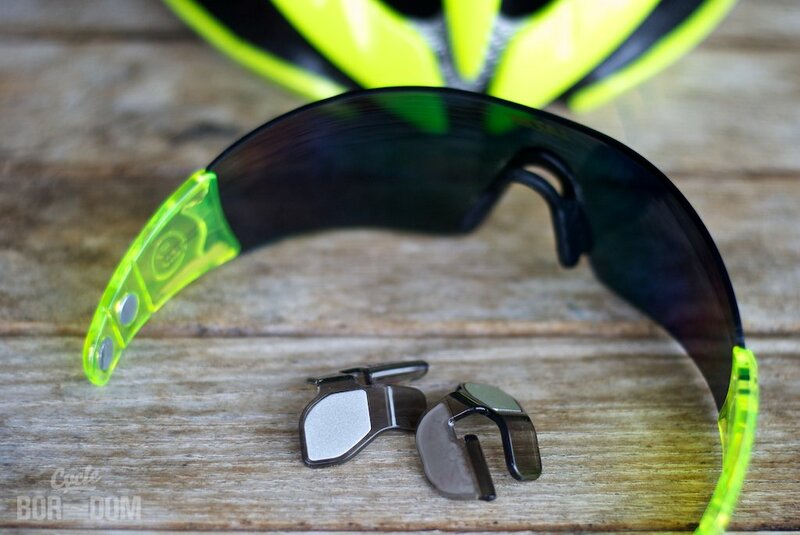 The Magneto system negates all those that don’t use an aggressive talon-esque curve like Oakley Jawbones or Smith PivLocks. But there’s a limit to the the tension the new thinner straps can provide in order to keep the glasses in place. When I initially install the system to my visage it’s tight. However, midway through a ride, I find myself adjusting them farther back in order to keep them tight. Eventually this technique pulls the strap towards the front of your face. In order to keep the strap taught, you’d have to over tighten the strap under your chin. If there was a way to increase the strength of the strap and magnet system so it wouldn’t pull forward, the system would end the need for temples altogether. Also, I’d love to see if there was a way to get them lighter. That would also greatly reduce its desire to move down your nose. PRO FACTORS: Great price, massive coverage, *highly* Euro styled, future-style ingenuity. OPPORTUNITIES: Weight, minor movement on the nose, *highly* Euro styled. 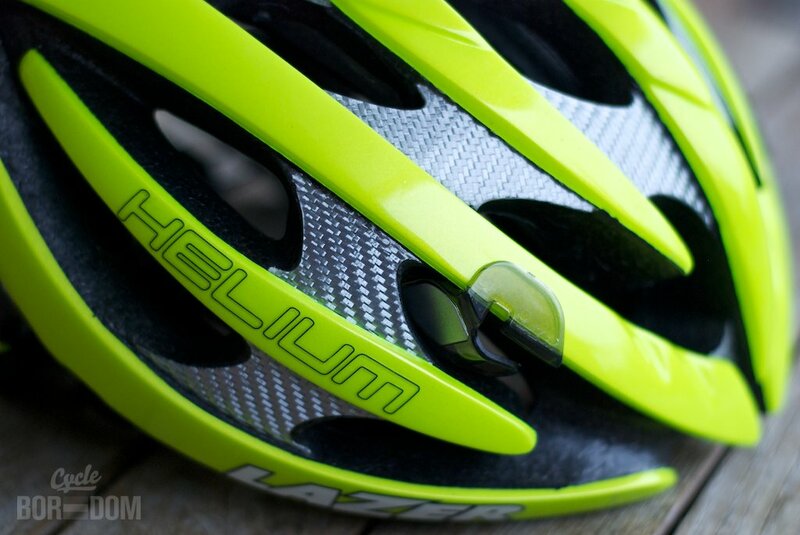 RATING—95%: (4.5 stars) Pelotonal level cycling optics with moar positives than Ferrari clients. The genius of the Lazer Magneto M1 is only tempered by the limitations inherent to its implementation. 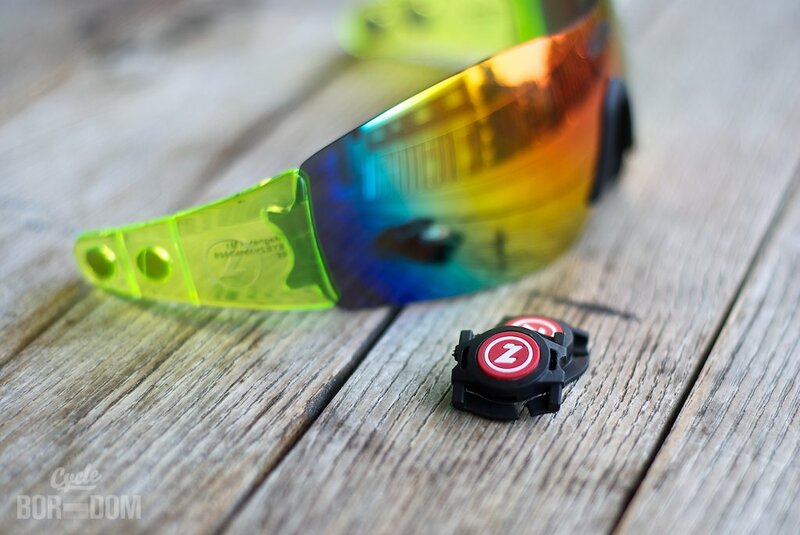 From the standpoint of a regular pair of cycling optics, these are a great buy at only $110. Factoring in the outside the box technology applied here, even when considering the opportunities stated above, they're a steal. 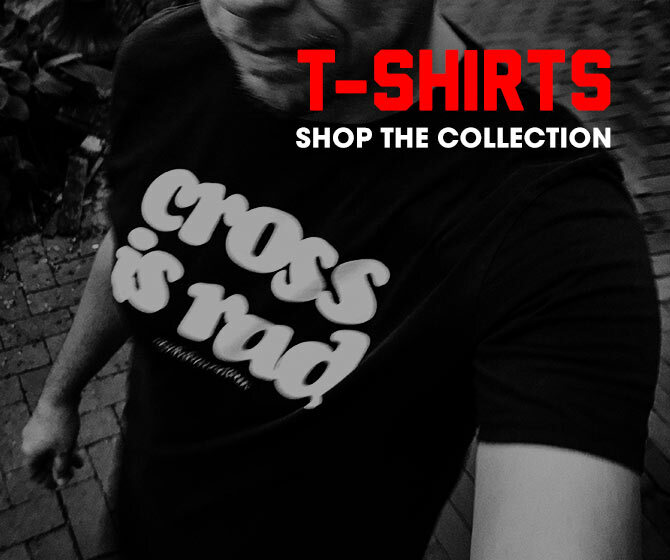 It's up to the consumer to decide if this system as well as the bold aesthetics is for them.